Today, 40 years ago, my best friend died. It was such a long time ago, and yet just a moment’s distance in my memory. We were just 17. That was the day the music died. Middle English carole, from Anglo-French, modification of Late Latin choraula choral song, from Latin, choral accompanist, from Greek choraulēs, from choros chorus +aulein to play a reed instrument, from aulos, a reed instrument. The irrepressible Carol: upside down. In less than two weeks, she was gone. The doctors thought she had mono, then hepatitis. They simply didn’t know what happened. The night she died, I was at school rehearsing for our Spring Choir concert. She should have been been with me on the rickety risers rather than in a hospital bed. I stood on the back row, singing, when images of my life without Carol flooded before my eyes. I pictured the Spring concert with an empty place where she should have been standing. I flashed forward to Senior night on the football field. She didn’t get roses from the players because she wasn’t there. She was missing from Senior prom, and Senior Day at the river park. And more. And more. I couldn’t hold back the tears, so I dashed out of the auditorium to find refuge in the entryway bathroom. I sobbed and sobbed. I didn’t understand what I was seeing. I thought perhaps she might be too weak to come back to school. We had so many plans for our Senior year. I couldn’t imagine not having her by my side for the highs and lows of life. I told myself I was being silly, pulled it together, and returned to rehearsal. The moment I opened my mouth to sing, I choked on fresh tears. More images flashed before my eyes. Carol wasn’t in any of them. I bolted from rehearsal, raced to my car, and headed home — with gut-wrenching sobs that made driving difficult. I searched for Daddy, who was rehearsing one of his youth choirs across the street from our house. He stopped rehearsal to console me. Daddy always made everything better. I was emotionally exhausted. I went home and collapsed on my bed. After Daddy got home a bit later, I heard the phone rang. He called me into the living room and sat me on his lap. Mother stood ashen by his side. Carol’s family had just called to say she died. She left this world at that very moment during rehearsal when the “my-life-without-Carol” slideshow started playing in my head. That day, I changed. I may have looked the same from the outside, but I was no longer a carefree teenager full of plans for the future. I got sucked inside the sink hole of my heart. I didn’t want talk about Carol to well-meaning outsiders. I hated being told how I should feel or how I should move forward. I really didn’t care what anyone said. I refused to give her up. I put my jagged heart in a treasure box that only I could access. She was my secret pain. No one could take her from me and I would never forget her. That was my vow. Fast forward to now. I can only write this blogpost because I’m cracking open my treasure box and setting Carol free. I’ve held her prisoner for far too long. I thank DC Metro Church for getting me to this place of freedom. In November last year, I was in a Thrive prayer service and David Stine, our pastor, said that someone in the group had a broken heart that needed healing. I was sitting up in the back row on the risers. I felt as if I’d been hit with a sledge hammer. The experience really shook me. I sat there processing. I didn’t think I had a broken heart. I walked through a list of adversaries at work, loved ones who died, divorce. Nothing clicked. I simply didn’t get it…until a small voice inside whispered the word, “Carol.” Gut punch. A groundswell of tears gushed out, as if a pipeline burst. I was thankful to be in the back of the sanctuary. What a revelation that I’ve been a “walking-wounded” for nearly four decades. I never saw myself that way. I imagined myself quite resilient. How wrong I’ve been. To top it off, I realized it was Carol’s birthday weekend. 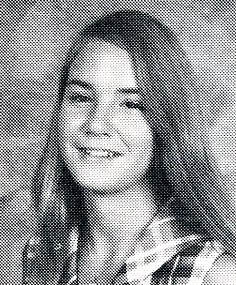 She would have turned 57. God, the Great Healer, revealed my broken heart when He knew I was strong enough to face it. I’d been praying to be fully the person God wanted, and He showed me He had to heal my heart first. He needed to get me to a place where I could freely give Him my most prized possession — Carol. She was the Thrive offering He wanted me to bring to the alter. So here’s the thing about broken hearts: sometimes we don’t know we have them, yet the jagged edges poke and prick and gash new holes as we bend and shift and stretch our hearts. We bleed internally, yet think we’re ok. We may feel pain, but we ignore it and distract ourselves with shiny objects. I’d stuffed my broken heart into a treasure box that I wouldn’t let anyone see. It was my way of keeping Carol alive — and not letting go. How many of you hold on to broken hearts, broken promises, broken dreams? 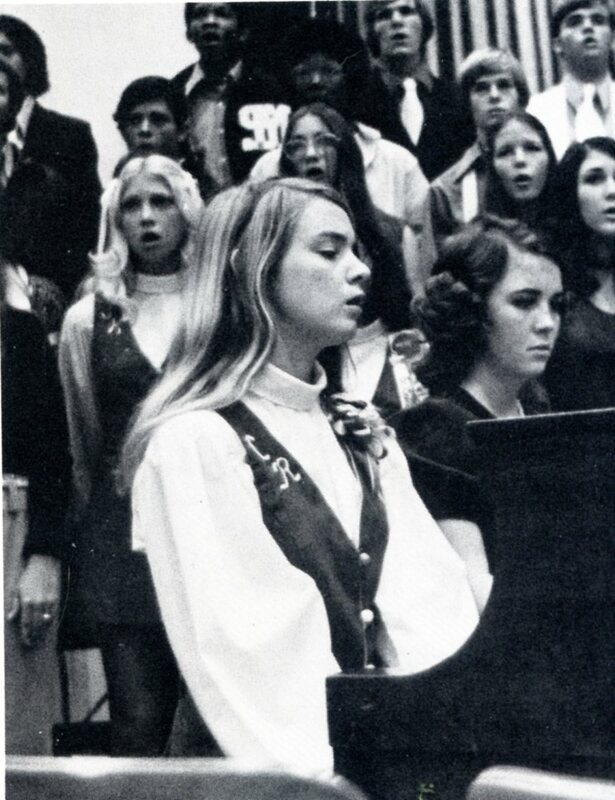 1973 San Marcos High School Choir portrait. Carol @ Left in Pink. Beth @ Right in Blue. I will look at you. You will look at me. You must deal with yours. I must deal with mine. We cannot change for each other. I must step aside and let you continue down your path. You must do the same for me. I do not know what I will encounter next, but I leave with a greater understanding of myself and others because of you. but, instead, just meet at the crossings. Thank you, Carol, for crossing my path. I’m different because of you. I miss you. If you’ve read earlier blogposts (listed at bottom) that I wrote about Africa, you already know my aunt Melody. We visited Melody in Zambia this summer while my uncle Phil came back to the U.S. for a medical procedure. Phil is my Daddy’s youngest brother. He’s not that much older than my brother and me, so we grew up more like cousins. I have so many stories I could tell you about Phil, but…I won’t. (Talk to me later.) I met Melody for the first time when my superstar basketball player uncle brought his cheerleader girlfriend home to meet the family. Melody taught us cheers out in my grandparents yard. We loved bubbly, fun Melody at first glance. And she’s still the same! Now Phil and Melody serve in Zambia. I asked Melody to share some of their life with you. I held this post until today, Thanksgiving Day. Seemed like the perfect time to share what they do for a living — a life serving God and giving thanks day by day. Feel free to fall in love with them too! How long have you and Phil served in Zambia? 3 years. We arrived October 12, 2006. Phil came to see the work of another missionary in 2000 and fell in love with the people. I came the following year and loved the people, but although I knew God wanted us to serve Him here, it took a couple of more years before this “city girl” agreed! But no, God chose Zambia and now I am so thankful. I love the people and feel a great burden to teach the children of the love of a Wonderful Savior — the One who would call me out of my little box — that I fit so well in– and bring me to this place half way around the world and open my eyes to the needs of the people here. Everywhere we go here becomes an opportunity to share the Gospel with a lost and dying world. What you see as the greatest need physical need of the people? Right now I would say that I think the greatest physical need of the people is clean water. There is a water shortage in the compounds and quite often there is no water for them to drink. The water that is available is dirty and loaded with who knows what. We (Amerians) know when it is so hot that we need to drink more, yet they drink less because of the diseases that come with bad water. What surprised you most you the most about living in Zambia? #9. I am totally surprised by elephants, giraffes, zebras, monkeys…okay all the “zoo” animals roaming around freely with no barriors. #8. I am surprised by little village boys who don’t often see vehicles using their flip flops as pretend cars making roads in the dirt and adding the correct “noises” to their game. #7. Going to the store to buy bread or milk or eggs and finding none…because management didn’t think to place an order. #6. The beauty of the sunsets and flowers. #5. No one is in a hurry. #4. The crude tools used to create works of beauty. #3. The “Thunder” of Victoria Falls. #2. Children carrying bables on their backs, and being responsible for siblings at such a young age. #1. But, the most surprising thing of all is the joy of the Lord that a soul set free has here in Zambia. They are not in a hurry to worship. They will sing and praise God all night and all day. And can they sing! I love to hear the Zambian voices lifted up in praise to the God who set them free. What do you like the best about your life? Serving the Lord day in and day out with Phil. I love the people both young and old. I love the adventure, the animals, the flowers and the opportunity fo depend on God daily to supply our needs. Phil and Melody Stephens on the Mighty Zambezi! Want Change? Bring Your Ax! I spoke to a group of University of Texas LBJ School graduates in Washington DC last night. The sky let loose like a water stampede the VERY moment I stepped to the lobby door at NASA Headquarters to catch a cab for my ride over 19th and Pennsylvania. Great. Nothing like showing up bedraggled (I love that word). Thanks guys for braving the weather to make it there! In my idealism and enthusiasm, I made a good many mistakes. I failed to see all the unwritten rules that govern how work is done — the CULTURE of the organization. Often, people steeped in the organizational culture are blind to it. So was I, at first. Change does NOT appeal to everyone. Shocking, I know. But as hard as it was for me to conceive, many are QUITE comfortable with status quo…AND may have built their identities around the Here-and-Now. The unknown may appear dark and murky and unappealing to some. To others, the unknown is an intriguing, thrilling challenge. Quick story: When my Mother came up to DC years ago, I suggested she hop on the Metro and explore what the City had to offer. Day after day I came home to find she hadn’t left the house. I couldn’t imagine all those missed opportunities, all the treasures left undiscovered — all within an easy 10 minute ride from the house. I mean, REALLY. WASHINGTON DC!!!! Wow. I’d never thought about it. I realized for the first time that I truly AM an explorer. I want to know what’s behind the unopened door. I look for new pathways, new approaches, new solutions. I want to know what I don’t know. My mother helped me understand why I was such a “pain in the backside” to my colleagues at work who dragged their feet with new projects or new approaches to old processes. They MUST have felt the same frustration with me my Mother did. They were perfectly content doing the same things the same ways as they always did before I entered the mix. I began to reassess how I viewed those resistance to change. I needed a better understanding on how “the world is ruled” (Pope Julius IIII quote above). I offer a few “unspoken truths” I’ve gleaned about everyday behavior within change-resistant people and the organizations in which they thrive. Every new idea is an idea that didn’t work in the past. Don’t ask why. Do it because it’s always been done this way. The answer is no, no matter the question. Hole-digging is easier than mountain-climbing. (Or, it’s easier to dig a hole than climb out of one. Comfort in process can mean discomfort with change. Bureau-train on autopilot. Conductor need not apply. None of these are solutions. They simply give me a starting point to understand where we get stuck and how we might inch forward from here. For example, look at #3: Activity=Outcome. I firmly believe this as the #1 reason the government resists telework/telecommuting initiatives. “Managing by Activity” means we measure success by how busy someone looks. We create “activity reports” and spend time filling them — which is “activity” in and of itself. We list the number of phone calls we make, or meetings we attend. Whew! Full day indeed! Yet, what did we accomplish? If managers measure performance by watching employees “be busy” rather than produce results, then how can a manager allow the employee to work outside his/her line of sight? “Managing by OUTCOME”…now that’s a scary thought to a culture steeped in activity-based success. We’re not good at giving employees a project with clear goals and deadline (OUTCOME), then setting them free to make the magic happen. If we were, we wouldn’t care where they got the job done — telework. Here’s another example. Let’s look at #6: the dreaded rut (read habit). If we’re stuck in the rut and want out, what tools do we need? Maybe it’s as simple as a rope or a ladder. Perhaps we need blasting powder. What next? Do we fill in the rut to prevent backsliding or retreat? How do we fill the rut? Sand bags? Dump truck? Shovel? Now what? Where do we go from here? What new path do we want to forge? Do we need a compass? Do we face barbed wire? Forest? Desert? Sea? Whichever direction we take will require different tools. You get my drift. Unspoken “givens” in an organization influence how we get the job done, whether we know it or not. I haven’t even TOUCHED the topic of change in a toxic organization, which can represent a direct assault on the power structure. Those in power will resist change with all available resources to preserve even the smallest appearance of authority. But, alas, I’ll leave this for another blog-post. the Federal bureaucracy moves at glacier-speed.